Rhodonite is an easily identifiable mineral, with its vitreous luster, its high gloss and its slight transparency. But it stands out especially by its color: this stone has a beautiful luminescence ranging from dark pink to red-brown. It can be marked by light black or dark gray splinters. Rhodonite is a metamorphic stone that can be found throughout the United States but also in Asia, particularly in China, Russia and also in France, especially in mountainous regions. When found in ores, it is often accompanied by other minerals such as calcite, magnetite or galaxite. Its natural form is that of crystals, which can be cut into smooth stones or jewels. 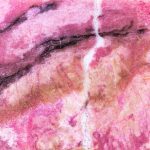 Rhodonite: what are its powers? Rhodonite is an anti-stress stone, it rebalances the body to calm emotional imbalances. On the physical level, it is a stone that will stimulate your immune defenses and promote your blood circulation. Wear it on the heart chakra to calm your heart rate in the event of an anxiety attack. It can also relieve some joint pain. It is a good stone to use during convalescence for example. On a mental level, it can help you during periods of stressful exams. It fights fear and stress and increases your mental faculties. The Romans used it to give themselves courage and perseverance during the hardships they encountered. On the emotional side, Rhodonite stone helps you get rid of old wounds and heal your scars. It acts on emotions by chasing away the negative energies that can inhabit you. It is also the stone to use if you feel a powerful emotional shock, press it against your heart to calm yourself in this kind of situation. If you have trouble sleeping, do not hesitate to put it on your heart. What should I use Rhodonite for? Rhodonite is recommended for all those who go through periods of stress or disruption: exams, job interviews, conflicts, etc. Anxious people will find appetite and sleep by wearing a Rhodonite stone. It pacifies relationships with oneself and others. For this reason, it can save a relationship by reducing jealousy and improving social relationships in general. Rhodonite is also indicated in the case of an injury, a burn or an insect bite. It must be applied to the concerned area to be effective. In a general way, this stone will bring well-being to any person in search of a physical and emotional balance, activating the chakra of the heart and improving the energy exchanges. You can wear it as a jewel or place it under your pillow when you’re going through a stressful time. The simplest is to have a Rhodonite stone decoration at home or in your room so that its anti-stress virtues act daily. You can have one on your desk at work. It is not necessary to recharge it, but its elements being the water and the sun, do not leave it locked up in a box. You can also put it in your bath, with different relaxing salts. So its power will spread in the water and you can enjoy a moment of absolute relaxation, you will be imbued with its benefits for several hours.